Donald Trump, who ran as an outsider and vilified Goldman Sachs during the campaign, is adding another veteran of the powerful Wall Street firm to his administration. Trump said Monday he will appoint Gary Cohn, second-in-command at Goldman Sachs (GS), as director of the influential National Economic Council. The leader of the NEC acts as the president's quarterback on the economy, coordinating policymaking between various agencies and programs to ensure it's in line with the administration's goals. The NEC chief works inside the White House and helps frame the debate on the biggest economic issues. Trump, in a statement, said Cohn will "design and coordinate" his administration's economic policy, working closely with the Treasury and Commerce departments. The post does not require Senate approval. Cohn, a 25-year Goldman Sachs veteran, made at least $123 million in total compensation since becoming the bank's sole president and chief operating officer in 2009, a review of filings shows. He had been rumored to be a candidate for a number of jobs within the Trump administration, including to head up the powerful Office of Management and Budget. Cohn is known as a markets expert and had been seen as the heir apparent to CEO Lloyd Blankfein. Yet Blankfein, who is now cancer free after a battle with lymphoma, hasn't signaled a desire to step down after a decade in the top job. "I'm confident that Gary will bring his many talents and expertise to the White House and will do his part to make our economy stronger for all Americans," Blankfein said in a statement. He added that Goldman Sachs will miss Cohn and that the American people and Trump are "fortunate that he has chosen to serve his country." Cohn will follow in the footsteps of a number of others with Goldman ties. The links to Goldman are already riling Trump's critics, including Sen. Bernie Sanders, who like Trump ran as an anti-establishment candidate. "It's called a rigged economy and this is how it works," Sanders tweeted out with a link to the news. 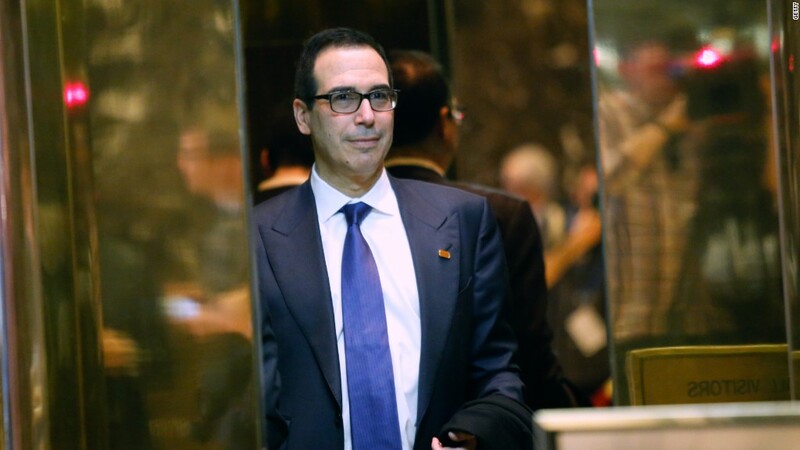 Trump's biggest hire yet has been Treasury Secretary pick Steve Mnuchin, who spent nearly two decades at Goldman before leaving in 2002. Mnuchin made $46 million while at Goldman, before leaving in 2002. Trump is also reportedly considering Anthony Scaramucci, who had two stints at Goldman Sachs, for a top post. Scaramucci is on Trump's transition team. Steve Bannon, a former Goldman banker turned Wall Street critic, was named Trump's chief strategist. Gary Cohn, president of Goldman Sachs, seen at Trump Tower. While Cohn is at the upper echelon of finance today, he has blue-collar roots that could appeal to Trump's populist message. Cohn grew up in Cleveland and his father was an electrician. Cohn started his professional career selling window frames and aluminum siding for the home products division of U.S. Steel. Cohn has said he was only able to break into finance through "pure drive and perseverance," including have to overcome dyslexia. 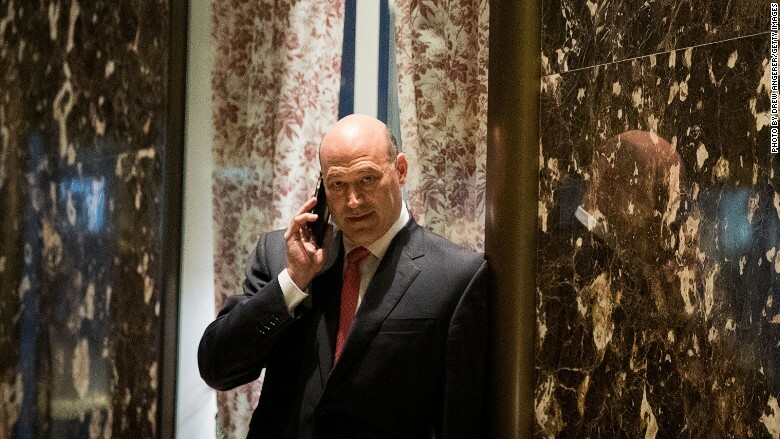 But even after he was hired by Goldman Sachs in 1990, Cohn started in the firm's less-prestigious metals trading division. Related: Trump sold stocks but what about his hedge fund millions? Yet Cohn worked his way up as a top trader at Goldman Sachs and became partner in 1994. More recently, Cohn helped Blankfein lead Goldman through the Wall Street meltdown that created a public backlash against big banks. Trump's decision to hire Goldman Sachs insiders is noteworthy. During the campaign, Trump vilified Goldman and bashed big banks. Trump's closing campaign ad flashed an ominous picture of Blankfein just as Trump condemned the "global power structure" for robbing America's working class. At one point during his primary fight, Trump claimed Goldman Sachs had "total, total control" over his rivals Hillary Clinton and Ted Cruz. Scaramucci pushed back against the Goldman hiring criticism. "The idea that ever working for Goldman Sachs automatically makes you the devil is one of the most irrational conspiracies in modern society," Scaramucci said on Twitter. Wall Street analysts are already cheering the personnel moves as good news for the big banks. Jaret Seiberg, an analyst at Cowen & Co., called Cohen's potential hiring as "the most bullish sign yet out of the Trump White House for the biggest banks." "It's clear that Trump does not see the biggest banks as a political problem," Seiberg wrote in a report.